The number of active oil and natural gas rigs in the Appalachian Basin's Utica Shale formation for the last week of October 2012 (ending October 26) has doubled compared with the level for the same week in 2011. The growth in active oil-directed rigs has more than offset the declines in active gas-directed rigs. According to Baker Hughes, about 86%, or 24 out of 28 active rigs in the Utica play, were directed toward drilling for shale oil during the last week in October, whereas a year ago only 15% of rigs were targeting shale oil in Utica. The 28 active rigs in that area represent 2% of all active rigs in the United States, according to data from the Baker Hughes U.S. Rig Count Reports. According to Bentek Energy, Chesapeake Energy Corporation operated 13 rigs in Ohio for the week ending October 26, 2012, accounting for nearly half of all operating rigs in the Utica. This compares with only four Chesapeake rigs operating for the week ending October 28, 2011. Of the six other operators that had active rigs in 2011, only one still had an active rig in 2012, indicating that the new drilling for shale oil in the Utica play is being carried out by new operators as well as Chesapeake. Chesapeake accounted for 112 of the 289 new well starts in Ohio recorded year-to-date for 2012, all of which were classified as having both oil and gas potential, according to Bentek. The Utica Shale play's 28 active rigs for the last week of October 2012 remain well below the 88 active rigs recorded for the Appalachian Basin's main shale play, Marcellus, according to Baker Hughes data. 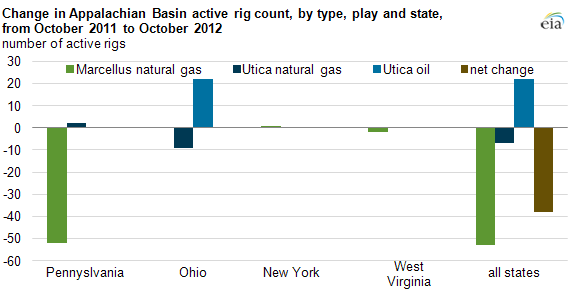 However, the Utica play's 15-rig year-on-year increase contrasts with a decline of 53 active rigs for the Marcellus. Drilling activity in the Marcellus Shale is predominantly focused on natural gas, mainly in Pennsylvania. For the Appalachian Basin as a whole, the result has thus been a shift away from drilling for Marcellus Shale gas in Pennsylvania and towards drilling for Utica Shale oil in Ohio. Source: Baker Hughes, U.S. Rig Count Reports dataset. The decrease in drilling for Marcellus Shale gas in Pennsylvania only appears to be occurring for regions of the state that produce dry gas, or natural gas that contains low volumes of liquid byproducts such as ethane, propane, butane, and pentane. 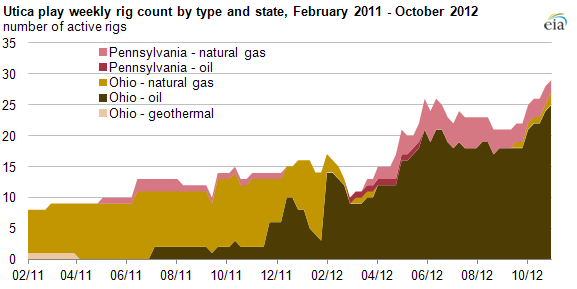 For these dry gas regions of the state's Marcellus play, the rig count fell by 56. For the four counties with rigs in Pennsylvania's southwestern wet gas region of Marcellus — where, as in Ohio, there are relatively higher volumes of liquid byproducts — the year-on-year weekly rig count increased, according to Baker Hughes data. Although the rig count in Marcellus has declined over the last year, average production of natural gas there rose by 72% between October 2011 and October 2012 to 6.8 billion cubic feet per day (Bcf/d), accounting for 26% of all U.S. natural shale gas production, according to EIA calculations based on LCI Energy Insight estimates. In 2011, Utica shale gas production in Ohio averaged 0.007 Bcf/d, while shale oil production averaged 127 barrels per day, according to the Ohio Department of Natural Resources Division of Mineral Resources Management.